A Rare Warning From Goldman: "Global Risk Appetite Is Becoming Increasingly Fragile"
As Goldman's Charles Himmelberg writes in a Sunday note, it has been a "summer to forget for EMs" - while the reason has been wild swings in EM stocks and currencies, both of which have seen sharp drops in recent months with the JP Morgan EM FX and MSCI EM equity indices registering declines of roughly 14% and 7%, the driving factor has been underperformance in EM growth relative to the US. As Goldman notes, US growth has managed to meet or beat the high growth expectations coming into the year, while "EM growth has disappointed". This is shown in the chart below which illustrates this contrast using Goldman's current activity indicators (CAIs) which remains elevated for the US but the EM CAI has fallen meaningfully this year. This is in contrast with 2017, during which both US and EM growth were steadily improving. What is more interesting is what Goldman shows on the right panel of the chart above, which provides a more granular picture of EM vs US economies, using the bank's proprietary MAP index of economic surprises and suggests there’s more to the story than just growth. In particular, EM data were “out-surprising” the US for most of Feb, March and April, but EM equities (in USD) were flat relative to US equities. This, Goldman claims, has to do with the fact that US real rates were diverging from the rest of the world, gradually "boiling the frog" on global risk assets. The chart below illustrates the real rate divergence for DM and EM, plotting the median and the 10-90 percentile range of 3-month real rates across countries, against which the US (real) rate is overlaid (we also extend these series through 2019 using GS forecasts). What is clear in the above chart is the coordinated growth in 2017, and also shows that the Feb-March surge in EM data surprises likely delayed the risk reckoning until April, at which point "a sharp deceleration in data surprises arguably exposed the divergence in policy rates." Goldman also projects the future of real rates in an attempt to show how much farther it is expected to go. This is a stark reversal of the "dollar carry trade" period, when US real rates were among the lowest in the world, and prompted a massive dollar-denominated debt scramble by the emerging markets. During most of 2011-2015, for example, they were at just the 10th percentile in DM, and more recently, during 2015-2016, they were at the 10th percentile in EM. And from 2011 onward, US real rates have averaged well below the median rate in both DM and EM. It was only in 2017 that US real rates crossed the DM median. But rise they have, having already risen to the 90th percentile in DM. And according to our forecasts, the divergence in real rates will rise substantially over the next year and a half, with US rates rising relative to both DM and EM. Absent this divergence, it seems unlikely that the recent disappointments in EM growth would have caused such a large price correction. 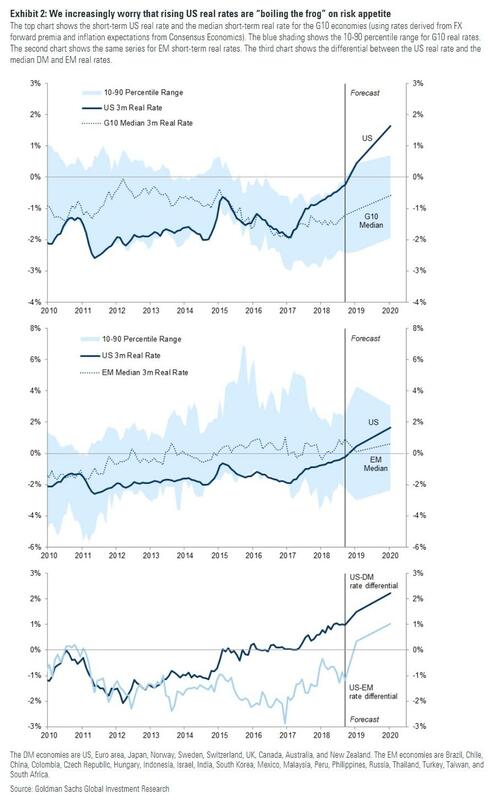 Looking at the real rates chart, Goldman highlights the growing “risk fragility” caused by rising US rates which is starting to extend beyond EM. And, as Himmelberg writes, "the risk we see now is that investors may be under-appreciating the headwind to risk appetite more broadly, just as the risks to EM from US real rates were arguably under-appreciated earlier this year." Indeed, we ourselves probably under-estimated the degree to which EM assets would prove sensitive to growth disappointments. And here comes the first warning from Goldman, which cautions that "looking ahead, and across risk markets more broadly, the experience in EM markets over the summer provides a timely reminder that global risk appetite is becoming increasingly fragile as real rates in the US press increasingly higher." As our equity strategists like to describe it, the outlook for risky asset returns is “fat and flat” — fatter tails and flatter returns. For EM investors, this will remain true even once EM growth begins to surprise again to the upside (as we expect it will). And in a stark warning for investors in developed markets, Goldman cautions that they may have not yet made the connection back to the fragility of risk appetite, "they may look back and realize they were overlooking the early warning signals." Hence, the "boiling frog" analogy. As a result, and following the lessons learned from this summer - as emerging markets tumbled in an otherwise sold market - Goldman is "feeling incrementally more cautious", and its core convictions are probably best summarized as “incrementally more cautious in recognition of an increasingly challenging trade-off between risk and reward” between now and year end, for the following three reasons. First, the real rate of return available on “safe” US assets is rising, both in absolute terms and relative to non-US markets (Exhibit 2). As the rate of return on “cash” rises, the appeal of risky assets falls. Here Goldman again points to rising US real rates, and adds that "the low level of real rates over most of the post-crisis period set a very low bar for risky assets. 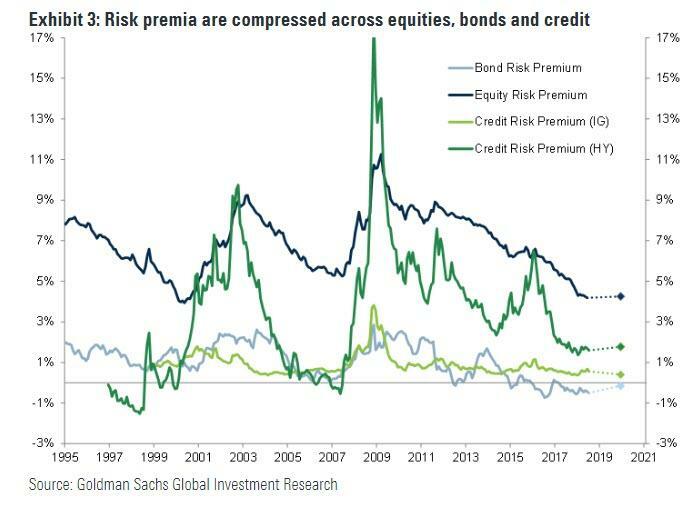 That bar is now rising, and as long as the US economy continues firing on all cylinders, the bar will continue to rise"
Second, Goldman risk premia on risky assets – the equity risk premium (ERP), credit risk premium (CRP), and bond risk premium (BRP) – have been compressing over the course of this expansion. These premia as shown in the chart below. While the compression of risk premia shown in this exhibit is typical over the course of most business cycle expansions, "but in this cycle, our measures of ERP and BRP, in particular, appear to have fallen to unusually low levels." Third, Goldman warns that risk itself is rising as the risk of macro imbalances (most visibly in labor markets) creeps steadily higher. Thus, the low risk premia available on most risky assets is steadily becoming even less appealing as the cycle ages. Specific factors aside, Goldman summarizes its increasingly bearish sentiment by listing the likely sources of further disruptions to risk appetite, which is topped by a more hawkish Fed. This is due in large part to the somewhat stronger-than-expected effects of the fiscal stimulus, as well as the record strength of business sentiment and the likely feedback of low unemployment into stronger household sentiment. Nor do we think the Fed is inclined to change course in response to foreign events. As we often argue, the appetite for US risk assets will likely hold up if rising policy expectations are driven by rising growth expectations. The risk to watch, therefore, is the risk that Fed speak turns more hawkish, which may suggest that the FOMC is applying a higher “beta” to its “data dependency”. If that isn't enough, Goldman also expects some risk that one of the "usual suspects" will re-emerge, including Italian debt, China growth, US trade wars, liquidity events like the VIX spike: "These all have the potential to surprise markets and upend risk appetite between now and year end." But Occam’s razor would suggest singling out the EM lesson from this summer, which is that rising US real rates – the world’s “safe asset” – are leaving risky assets more vulnerable to otherwise-manageable imperfections in the risk environment. Goldman's point are all valid, but the main reason the frogs may have no reason to worry is that every time the water approached boiling in the past, the Fed would quickly step in and promptly restore the bath to its enjoyably balmy state. Whether this time is different remains to be seen.